Diego Rodríguez de Silva y Velázquez ( June 6, 1599 – August 6, 1660), commonly referred to as Diego Velázquez, was a Spanish painter, the leading artist in the court of King Philip IV. He was an individualistic artist of the contemporary baroque period, important as a portrait artist. His two visits to Italy while part of the Spanish court are well documented. In addition to numerous renditions of scenes of historical and cultural significance, he created scores of portraits of the Spanish royal family, other notable European figures, and commoners, culminating in the production of his masterpiece, Las Meninas (1656). From the first quarter of the nineteenth century, Velázquez's artwork was a model for the realist and impressionist painters, in particular Édouard Manet. Since that time, more modern artists, including Spain's Pablo Picasso, Francisco Goya and Salvador Dalí, have paid tribute to Velázquez by recreating several of his most famous works. Velázquez, born in Seville, Andalusia early in June 1599, and baptized on June 6, was the son of Juan Rodríguez de Silva, a lawyer of noble Portuguese descent, and Jerónima Velázquez, a member of Seville's hidalgo class, an order of minor aristocracy (it was a Spanish custom, in order to maintain a legacy of maternal inheritance, for the eldest male to adopt the name of his mother). He was educated by his parents to fear God and, intended for a learned profession, received good training in languages and philosophy. But he showed an early gift for art; consequently, he began to study under Francisco de Herrera, a vigorous painter who disregarded the Italian influence of the early Seville school. Velázquez remained with him for one year. It was probably from Herrera that he learned to use brushes with long bristles. After leaving Herrera's studio when he was 11 years old, Velázquez began to serve as an apprentice under the pedantic Francisco Pacheco, a founded artist and teacher in Seville. Though considered a generally dull, commonplace painter, at times Pacheco would express a simple, direct realism that is in contradiction to the style of Raphael that he was taught. Velázquez remained in Pacheco's school for five years, studying proportion and perspective and witnessing the trends in the literary and artistic circles of Seville. Velázquez fell in love with Pacheco's daughter Juana, whom he married in 1618 with Pacheco's hearty approval. The young painter set himself to begin recreating in his art common things—earthenware jars of the country people, birds, fish, fruit and flowers of the marketplace. These early paintings were called bodegones from bodegon, a cheap eating house, and depict common everyday low-life street scenes in a sombre manner with the humble characters portrayed with great dignity and gravitas. 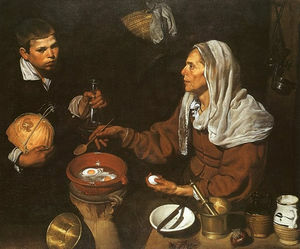 Notable examples of these bodegones are Vieja friendo huevos (1618, English: An Old Woman Frying Eggs) and perhaps his finest painting from this early period The Water-seller of Seville (c1620). By the early 1620s his position and reputation were assured in Seville; Velázquez's wife in these years bore him two daughters—his only known family. The younger, Ignacia, died in infancy, while the elder, Francisca, in due time married Bautista del Mazo, a painter. Velázquez produced other notable works in this time. Sacred subjects are depicted in Adoración de los Reyes (1619, English: The Adoration of the Magi), and Jesús y los peregrinos de Emaús (1626, English: Christ and the Pilgrims of Emmaus), both of which begin to express his more pointed and careful realism. Velázquez went to Madrid in the second half of April 1622, with letters of introduction to Don Juan de Fonseca, himself from Seville, who was chaplain to the King. At the request of Pacheco, Velázquez painted the portrait of the famous poet Luis de Góngora y Argote. Velázquez painted Góngora crowned with a laurel wreath, but at some unknown later date painted over it. It is possible that Velázquez stopped in Toledo on his way from Seville, on the advice of Pacheco, or back from Madrid on that of Góngora, a great admirer of El Greco, having composed a poem on the occasion of his death. Through an equestrian portrait of the king, painted in 1623, Velázquez secured admission to the royal service with a salary of 20 ducats per month, besides medical attendance, lodgings and payment for the pictures he might paint. The portrait was exhibited on the steps of San Felipe and was received with enthusiasm. It is now lost. The Museo del Prado, however, has two of Velázquez's portraits of the king (nos. 1070 and 1071) in which the severity of the Seville period has disappeared and the tones are more delicate. The modeling is firm, recalling that of Antonio Mor, the Dutch portrait painter of Philip II, who exercised a considerable influence on the Spanish school. In the same year the Prince of Wales (afterwards Charles I) arrived at the court of Spain. Records indicate that he sat for Velázquez, but the picture is now lost. It is canonical to divide the artistic career of Velázquez by his two visits to Italy, with his second grouping of works following the first visit and his third grouping following the second visit. This somewhat arbitrary division may be accepted though it will not always apply, because, as is usual in the case of many painters, his styles at times overlap each other. Velázquez rarely signed his pictures, and the royal archives give the dates of only his most important works. Internal evidence and history pertaining to his portraits supply the rest to a certain extent. In 1629 Philip gave Velázquez permission to carry out his desire of visiting Italy, without loss of salary, making him a present of 400 ducats to which Olivares added 200. He sailed from Barcelona in August in the company of the Marqués de Spinola, the conqueror of Breda, then on his way to take command of the Spanish troops at Milan. It was during this voyage that Velázquez must have heard the details of the surrender of Breda from the lips of the victor, and he must have sketched his fine head, known to us also by the portrait by Van Dyck. In Venice, Velázquez made copies of Tintoretto's Crucifixion and Last Supper which he sent to the king, and in Rome he copied Michelangelo and Raphael, lodging in the Villa Medici till fever compelled him to retire into the city. Here he painted the La fragua de Vulcano (1630, The Forge of Vulcan; no. 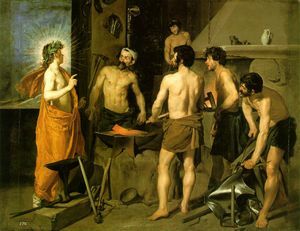 1171 of the Museo del Prado), in which Apollo narrates to the astonished Vulcan, the blacksmith of the gods portrayed here as a village blacksmith, the news of the infidelity of Venus, while four others listen to the scandal. 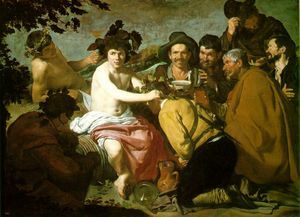 The mythological treatment is similar to that of The Drunks: it is intimately realistic and innately Spanish, giving a picture of the interior of a smithy of Andalusia, with Apollo inserted to make the story tell. The conception is commonplace, yet the impression it produces is from the vividness of the representation and the power of expression. The modeling of the half-naked figures is extremely detailed. Altogether, this picture is much superior to his other work painted at the same time, La túnica de José (1630, English: Joseph's Bloody Coat), which now hangs in the Escorial. Both of these works are evidently painted from the same models. Curiously absent from both of these works, however, is the influence of the Italians. In Rome, Velázquez also painted two beautiful landscapes of the gardens of the Villa Medici. Landscape was uncommon in Spanish art, but Velázquez showed how capable he was in this branch as well. The silvery views of Aranjuez, which at one time passed under his name, are now considered the work of his pupil and son-in-law Mazo. After a visit to Naples in 1631, where he worked with his countryman José Ribera and painted a charming portrait of the Infanta Maria, sister of Philip, Velázquez returned early in the year to Madrid. 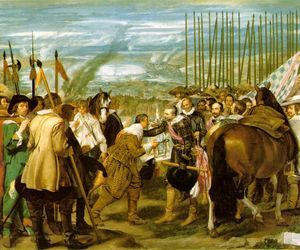 La rendición de Breda (1634-1635, English: The Surrender of Breda) was inspired by Velázquez's first visit to Italy, in which he accompanied Ambrosio Spínola, who conquered the Dutch city of Breda a few years prior. This masterwork depicts a transfer of the key to the city from the Dutch to the Spanish army during the Siege of Breda. The powerful minister Olivares was the early and constant patron of the painter. His impassive, saturnine face is familiar to us from the many portraits painted by Velázquez. Two are notable; one is a full-length, stately and dignified, in which he wears the green cross of Alcantara and holds a wand, the badge of his office as master of the horse, the other, a great equestrian portrait in which he is flatteringly represented as a field marshal during action. In these portraits, Velázquez has well repaid the debt of gratitude that he owed to his first patron, whom Velázquez stood by during Olivares's fall from power, thus exposing himself to the great risk of the anger of the jealous Philip. The king, however, showed no sign of malice towards his favorite painter. The sculptor Montafles modeled a statue of one of Velázquez's equestrian portraits of the king, painted in 1636, which was cast in bronze by the Florentine sculptor Tacca and which now stands in the Plaza del Oriente at Madrid. The original of this portrait no longer exists, but several others do. Velázquez, in this and in all his portraits of the king, depicts Philip wearing the golilla, a stiff linen collar projecting at right angles from the neck. It was invented by the king, who was so proud of it that he celebrated it by a festival followed by a procession to the church to thank God for the blessing. Thus, the golilla was the height of fashion, and appeared in most of the male portraits of the period. Besides the forty portraits of Philip by Velázquez, he painted portraits of other members of the royal family: Philip's first wife, Isabella of Bourbon, and her children, especially her eldest son, Don Baltasar Carlos, of whom there is a beautiful full-length in a private room at Buckingham Palace. Cavaliers, soldiers, churchmen and poets of the court, as, for example, the Quevedo at Apsley House, sat to the painter and, even if forgotten by history, will live on his canvas. The Spaniards have always been cautious to commit to canvas the portraits of their beautiful women. Queens and infants may be painted and exhibited, but ladies rarely. One wonders who the beautiful woman can be who adorns the Wallace collection, a brunette so unlike the usual fair-haired female sitters to Velázquez. This picture is one of the ornaments of the Wallace collection. However, if few ladies of the court of Philip have been depicted, Velázquez painted several of his buffoons and dwarfs. Velázquez appears to represent them with respect and sympathetically, as in El Primo (1644, English: The Favorite), whose intelligent face and huge folio with ink-bottle and pen by his side show him to be a wiser and better-educated man than many of the gallants of the court. Pablo de Valladolid (1635, English: Paul of Valladolid), a buffoon evidently acting a part, and El Bobo de Coria (1639, English: The Buffoon of Coria) belong to this middle period. The greatest of the religious paintings by Velázquez also belongs to this middle period, the Cristo Crucificado (1632, English: Christ on the Cross). It is a work of tremendous originality, depicting Christ immediately after death. The Savior's head hangs on his breast and a mass of dark tangled hair conceals part of the face. The figure stands alone. The picture was lengthened to suit its place in an oratory, but this addition has since been removed. Accompanied by his manservant Pareja, whom he trained in painting, Velázquez sailed from Málaga in 1649, landing at Genoa, and proceeded from Milan to Venice, buying paintings of Titian, Tintoretto and Veronese as he went. At Modena he was received with much favour by the duke, and here he painted the portrait of the duke at the Modena gallery and two portraits that now adorn the Dresden gallery, for these paintings came from the Modena sale of 1746. 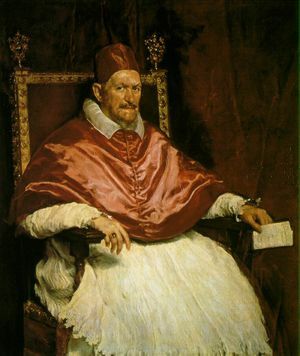 Those works presage the advent of the painter's third and latest manner, a noble example of which is the great portrait of Pope Innocent X in the Doria Pamphilj Gallery in Rome, where Velázquez now proceeded. There he was received with marked favour by the Pope, who presented him with a medal and golden chain. Velázquez took a copy of the portrait—which Sir Joshua Reynolds thought was the finest picture in Rome—with him to Spain. Several copies of it exist in different galleries, some of them possibly studies for the original or replicas painted for Philip. Velázquez, in this work, had now reached the manera abreviada, a term coined by contemporary Spaniards for this bolder, sharper style. The portrait shows such ruthlessness in Innocent's expression that some in the Vatican feared that Velázquez would meet with the Pope's displeasure, but Innocent was well pleased with the work, hanging it in his official visitor's waiting room. 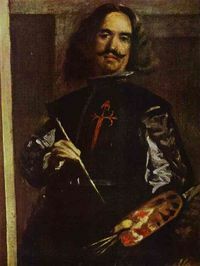 King Philip wished that Velázquez return to Spain; accordingly, after a visit to Naples, where he saw his old friend José Ribera, he returned to Spain via Barcelona in 1651, taking with him many pictures and 300 pieces of statuary, which afterwards were arranged and cataloged for the king. Undraped sculpture was, however, abhorrent to the Spanish Church, and after Philip's death these works gradually disappeared. Isabella of Bourbon had died in 1644, and the king had married Marie-Anne of Austria, whom Velázquez now painted in many attitudes. He was specially chosen by the king to fill the high office of aposentador major, which imposed on him the duty of looking after the quarters occupied by the court—a responsible function which was no sinecure and one which interfered with the exercise of his art. Yet far from indicating any decline, his works of this period are amongst the highest examples of his style. 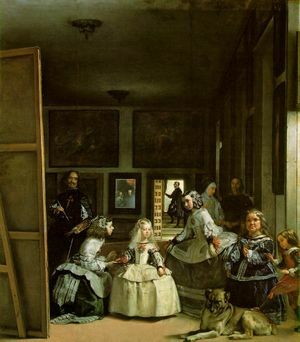 One of the infantas, Margarita, the eldest daughter of the new Queen, is the subject of Las Meninas (1656, English: The Maids of Honour), Velázquez's magnum opus. Created four years before his death, it is a staple of the European baroque period of art. An apotheosis of the work has been effected since its creation; Luca Giordano, a contemporary Italian painter, referred to it as the "theology of painting," and the seventeenth century Englishman Thomas Lawrence cited it as the "philosophy of art," so decidedly capable of producing its desired effect. That effect has been variously interpreted; Dale Brown points out an interpretation that, in inserting within the work a faded portrait of the king and queen hanging on the back wall, Velázquez has ingeniously prognosticated the fall of the Spanish empire that was to gain momentum following his death. Another interpretation is that the portrait is in fact a mirror, and that the painting itself is in the perspective of the King and Queen, hence their reflection can be seen in the mirror on the back wall. It is said the king painted the honorary Cruz Roja (Red Cross) of the Orden de Santiago ( Order of Santiago) on the breast of the painter as it appears today on the canvas. However, Velázquez did not receive this honour of knighthood until three years after execution of this painting. Even the King of Spain could not make his favorite a belted knight without the consent of the commission established to inquire into the purity of his lineage. This aim of these inquiries would be to prevent the appointment to positions of anyone found to have even a taint of heresy in their lineage—that is, a trace of Jewish or Moorish blood or contamination by trade or commerce in either side of the family for many generations. The records of this commission have been found among the archives of the Order of Santiago. Velázquez was awarded the honour in 1659. His occupation as plebeian and tradesman was justified because, as painter to the king, he was evidently not involved in the practice of "selling" pictures. In his book The Order of Things, philosopher Michel Foucault devotes the entire opening chapter to a detailed analysis of Las Meninas. He describes the ways in which the painting problematizes issues of representation through its use of mirrors, screens, and the subsequent oscillations that occur between the image's interior, surface, and exterior. One of his final works was Las hilanderas (The Spinners), painted circa 1657, representing the interior of the royal tapestry works. It is full of light, air and movement, featuring vibrant colors and careful handling. Anton Raphael Mengs said this work seemed to have been painted not by the hand but by the pure force of will. It displays a concentration of all the art-knowledge Velázquez had gathered during his long artistic career of more than forty years. The scheme is simple—a confluence of varied and blended red, bluish-green, grey and black. In 1660 a peace treaty between France and Spain was to be consummated by the marriage of Maria Theresa with Louis XIV, and the ceremony was to take place in the Island of Pheasants, a small swampy island in the Bidassoa. Velázquez was charged with the decoration of the Spanish pavilion and with the entire scenic display. Velázquez attracted much attention from the nobility of his bearing and the splendor of his costume. On June 26 he returned to Madrid, and on the July 31 he was stricken with fever. Feeling his end approaching, he signed his will, appointing as his sole executors his wife and his firm friend named Fuensalida, keeper of the royal records. He died on August 6, 1660. He was buried in the Fuensalida vault of the church of San Juan Bautista, and within eight days his wife Juana was buried beside him. Unfortunately this church was destroyed by the French in 1811, so his place of interment is now unknown. There was much difficulty in adjusting the tangled accounts outstanding between Velázquez and the treasury, and it was not until 1666, after the death of King Philip, that they were finally settled. Until the nineteenth century, little was known outside of Spain of Velázquez's work. His paintings mostly escaped being stolen by the French marshals during the Peninsular War. In 1828 Sir David Wilkie wrote from Madrid that he felt himself in the presence of a new power in art as he looked at the works of Velázquez, and at the same time found a wonderful affinity between this artist and the English school of portrait painters, especially Henry Raeburn. He was struck by the modern impression pervading Velázquez's work in both landscape and portraiture. Presently, his technique and individuality have earned Velázquez a prominent position in the annals of European art, and he is often considered a father of the Spanish school of art. Although acquainted with all the Italian schools and a friend of the foremost painters of his day, he was strong enough to withstand external influences and work out for himself the development of his own nature and his own principles of art. 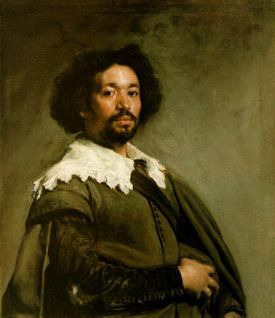 Velázquez is often cited as a key influence on the art of Édouard Manet, important when considering that Manet is often cited as the bridge between realism and Impressionism. Calling Velázquez the "painter of painters," Manet admired Velázquez's use of vivid brushwork in the midst of the baroque academic style of his contemporaries and built upon Velázquez's motifs in his own art. The importance of Velázquez's art even today is evident in considering the respect with which twentieth century painters regard his work. Pablo Picasso presented the most durable homage to Velázquez in 1957 when he recreated Las Meninas in his characteristically cubist form. While Picasso was worried that if he copied Velázquez's painting, it would be seen only as a copy and not as any sort of unique representation, he proceeded to do so, and the enormous work—the largest he had produced since Guernica in 1937—earned a position of relevance in the Spanish canon of art. Picasso retained the general form and positioning of the original in the framework of his avant-garde cubist style. Salvador Dalí, as with Picasso in anticipation of the tercentennial of Velázquez's death, created in 1958 a work entitled Velázquez Painting the Infanta Margarita. The colour scheme shows Dalí's serious tribute to Velázquez; the work also functioned, as in Picasso's case, as a vehicle for the presentation of newer theories in art and thought— nuclear mysticism, in Dalí's case. Ricardo Pecharromán celebrated the quadricentennial of Velázquez's birth in 1999 by recreating a number of Velázquez's works in a postmodern style.